It’s not often that we get to have conversations with spectators. Usually they are more interested in finding their seats and we are more interested in getting a cluster of Rights Holding Broadcasters (RHBs) on-the-air on time. 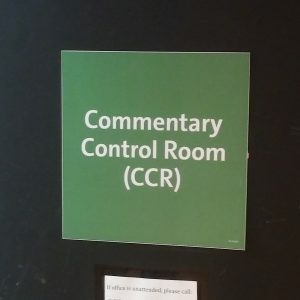 But the fact that our control room is located right between the doors to the men’s and women’s restrooms on the top floor of the venue means that lost spectators do occasionally find us. A few nights ago, before the start of a quarter-finals match with a close-to-capacity crowd, there were a lot of people milling around just outside our door which had accidentally been left open. “What is this place?” a voice asked, jerking my attention away from the screen in front of me. The voice belonged to a man who seemed somewhat bewildered, perhaps expecting to find the family bathroom and instead discovering a concrete cave some 40′ x 20′ occupied by a couple of guys, a bunch of video monitors, a rack of equipment and a Coca-Cola refrigerator. Not fancy, but also not expected. “What happens here?” he inquired again. His questions then ventured into areas that are not part of what we do, but still worth pondering. The screens he was referring to are the ones at each end of the stadium. These screens do show some of the broadcast, but they also put up graphics not unlike the ones you see in a bowling alley of the dancing bowling pins falling down when you get a strike. Their purpose is to provide scoring information and otherwise give the audience something else to look at. Given the number of armchair quarterbacks we have watching American football, our guess is that it’s to enable the officials to make a call and not be second-guessed by everyone in the stadium. Call it crowd control. After all, it’s fine for someone in the comfort and isolation of his own home to see the playback and decide the official made the wrong call. It’s quite another thing for 42,000 people see it together and, moving as one, decide to discuss the finer points of officiating with the official in question. So, keeping the replay off the screen minimizes the likelihood of a riot. There you have it. Another mystery solved. Or not. The conversation went on for another minute or so until the gentleman moved on to fulfill his greater purpose whatever that may have been. For me, though, I paused to appreciate the fact that I just got to talk to an average person who was NOT part of the broadcast team, who had managed to make it to this part of Brazil and get tickets for an Olympic event, and who had carved a moment out of his life to talk to me. It made what I do feel special, but it also enabled me to experience a moment of The Games through the eyes of a man who stumbled behind-the-scenes and brought a different perspective. I got to hear what he thinks about the games and about our coverage (and about not getting to see the instant replays in the stands, which is not actually something Olympic Broadcasting services controls). This is my fourth time to broadcast the Olympics, and as cool as that job is, it never matches the enjoyment I feel getting to share this brief part of life with people from all over the planet who come from very different cultures, political systems, religious faiths and worldviews. This wayward spectator became one of the many people who made that day and my life that much richer. Maybe we should all leave our doors open more often.